Luckily, water is plentiful along the Long Trail. There are few stretches (if any, depending on season) that one needs to carry a lot of water. Generally, it is easy to get water from clear moving creeks and streams on the LT. Some folks new to long distance hiking fret a bit about water…. (or there friends and families fret for them). On the Long Trail, we are fortunate that there is reliable water nearly the whole route. Simply earmarking the shelters as places with likely sources for water will go a long way. To some degree , our water needs are universal. We all need a lot of water. When we are exercising, we need more water. Nothing new there. However, I’ve run into people who have been quite dehydrated, and even one guy (on the Pacific Crest Trail) that was airlifted off the trail for dehydration. While East Coast hiking doesn’t share the same scarcity of water that the West Coast of the US can, it is still wise to be mindful of hydration. Start the day by drinking a healthy amount of water ( a half liter to a full liter, ideally). It will help with the morning cobwebs as well as get you a good start on hydration for the day. During the day, don’t wait till you are thirsty to drink. Drink regularly, you will feel better. Thinking ahead will serve you well. If you are nearly empty and passing a decent water source, drink your last bit, fill a bottle and start water treatment on that bottle. You will then have something ready to drink as you move on. For east coast (US) hiking, my water carrying capacity is 3 liters. This is in the form of one disposable bottle (Gatorade or Powerade type) and a Platypus 2L pouch. Most of the time the Platypus bag is rolled up in the back of my pack and not in use. On occasion it will make an appearance, particularly if I am not camping near water and want the additional water available for cooking or just ready to go in the morning. I like the Gatorade/Powerade type bottles because they are regularly available, tough, lightweight, and well fitting in most side panel pockets on packs. These bottles tend to be cheap during the summer hiking season and the Powerade bottles are often found for $1 or less at grocery stories. Many hikers will use one of these for a week or two, then treat themselves to a new one at a town stop. 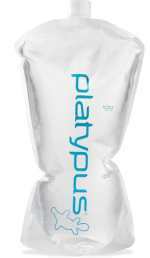 The Platypus water pouch that I use is .8 oz, tough and compact when not in use. I am pretty surprised how well the Platypus 2L holds up. I have had one of mine for over 4000 miles of hiking. Even with the folding and unfolding many times, this bottle lives on. Check out the Platypus Platy Bottle 2-Liter I am told that not all of the Platypus water bottles are created equally. The ones that have some colors on the bottle are not of the same quality, based on the experience of a few folks I have met on the trail. The bottle above that is clear with the blue ‘Platypus’ writing is the one that has worked so well for me. Generally, the water in the Green Mountains can be considered fairly clean water, but one runs the risk of a waterborne parasite such as Giardia or Cryptosporidium at any water source on the trail. For that reason, I recommend using some kind of sterilization/purification technique for water treatment on the Long Trail. Over the years, I have used a few different methods for purification/sterilization: Chemical treatment, UV light treatment and filtering. Each has its own benefits and drawbacks. What follows is a discussion of each to help you make a decision for your own treatment on the trail. I used a UV light treatment device for nearly all of my first thru hike (AT). It was a Steripen© unit and my wife and I shared this for the hike. These devices use similar technology to that which is used in some modern water treatment plants. At 5 oz, there was not a huge weight penalty for that particular device that we used. While I have heard complaints from some hikers about these not working well all the time, I found that if we thoroughly dried the unit after each use, the device operated reliably. There are some limitations with the water bottles that can be used, but this is easily figured out once you have the device. I’d advise carrying an extra set of batteries. 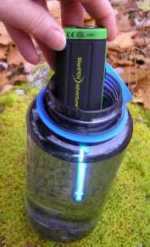 Currently, I’d recommend the SteriPEN Adventurer Opti UV Water Purifier if considering a UV Filter. The two types of chemical treatment that I have used and appear to be the most common on the trails are straight-up household bleach, and Aqua Mira© . Aqua Mira is a two part mixture. The two solutions are mixed together, and set aside for a five minutes to react, then added to water. After 15-30min, the water is safe to drink. With bleach, most hikers will do some research and make a personal decision about how much bleach to add to a specific amount of water as well as well as the needed waiting time before drinking. The American Red Cross has some data on this if you do some searches on the net. All sources that I have encountered recommend using a dropper for adding water to your water, and that only non-scented bleach should be used. 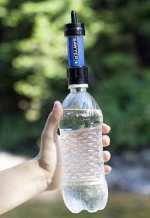 Aqua Mira comes in small bottles that are lightweight and compact. If I am using bleach, I put it into a small container, so that its weight when full is usually around 1 oz. Both are easy to add to bottles and bladders and they sterilize all the water in the bottle. Bleach is probably the most inexpensive of all water sterilization/purification techniques. I have had bottles leak, as well as get holes in them…discoloring my pack hip belt pockets and a shirt, so choose your vessel wisely. After dipping a bottle in a water source, I will wipe down the outside edge that my mouth will touch with a bandana or edge of my shirt, as the water on the outside of the bottle will not get treated. I used a chemical water treatment on my hike of the Long Trail, as well as on the Pacific Crest Trail. 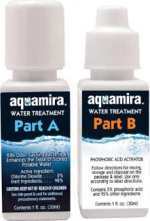 More info on Aquamira Water Treatment Drops. All the above being said, I do not endorse any one particular method over others for treating your water (you can see from the above, that I continue to experiment from season to season). Do a bit of research and make an informed decision for your health.